By April 25 2014 all member associations willing to host Euro 2020 games are required to file in their detailed bids. But already now, exactly until today the associations had time to officially express interest in grabbing a piece of the pan-European tournament. The complete list will be subject to discussion by the UEFA Executive Committee during the upcoming meeting on Sept 19-20. 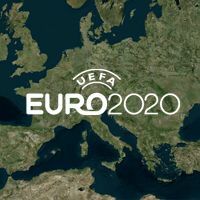 Just as a reminder – the minimum capacity for Euro 2020 stadia is set at 50,000, while a total of 13 cities/stadia in 13 countries are to be chosen by UEFA. Two exceptions are possible for stadiums smaller than 50,000, but not smaller than 30,000. This is thought to give more countries a chance at hosting the tournament, but only the group phase and first knock-out round. Quarterfinal games are to be held 60,000+ grounds, while the final requires no less than 70,000 capacity. We already know some candidates who have publicly confirmed their interest and are due to submit formal bids in the upcoming months. Belarus – Minsk (new national stadium). Demolition of the old structure is under way, which means we should see first elements of the new 40,000-seater in 2014. The pace is good enough to be solid bid for 2020 and capacity leaves Belarus the fight for one of two small-stadium spots. Belgium – Brussels (new national stadium). Though no public funding is to be designated for this project, it was the public authorities who had to approve the vision. New 50,000-seater will replace the current one and is understood to provide multi-event facilities, allowing for the pitch to slide out. Bulgaria – Sofia (new national stadium). At this point it isn't clear whether Bulgaria will apply for the regular 50,000+ capacity or for one of two exceptions for smaller stadiums. What is clear is that after months of silence the new national stadium idea is alive and kicking, recently approved by the government. Czech Republic – Prague (new stadium). Details of the building aren't known yet, but Czechs are hoping to get hold of one of two 30,000+ spots with their new stadium, Most probable location of the ground is Strahov, where Sparta currently has their training centre in what used to be Europe's largest stadium. England – London (Wembley). It's no secret that England were hoping to snap the final and both semifinals with their bid and Wembley remains the most modern large stadium across Europe at this time, not even mentioning the heritage of English football, acknowledged by UEFA recently when Wembley was granted two Champions League finals in 2011 and 2013. however, recently speculations said London may be bidding for a less important package, leaving all top games for Istanbul. France – Lyon (Stade des Lumieres). Just as predicted Paris wasn't declared candidate, perhaps due to the very strong bid by London. Instead, the French FA want Lyon to compete for one of the 12 smaller match packs. Germany - Munich (Allianz Arena). Choosing between two finalists wasn't easy for DFB, but in the end Munich won with Berlin as the single German bid. However, the federation decided not to fight for top three games, leaving them to Turkey. Greece - Athens (OAKA). The country may be troubled by crisis, but both the football association and government confirmed they will bid with the Olympic Stadium to get one of the 12 regular match packages. Hungary – Budapest (new national stadium). Just as announced for months now, Hungarian FA decided to apply with the Nemzeti Sport Kozpont (or the national sports centre) main stadium. With over 65,000 it seems to be a very strong bid for Central Europe. Netherlands – Amsterdam (Amsterdam ArenA). With the new Feyenoord stadium cancelled and no solid vision for Rotterdam, Amsterdam was the only sensible option for a Dutch bid and this was submitted by the KNVB. Poland – Warsaw (Stadion Narodowy) and Chorzów (Stadion Śląski). With two stadia of over 50,000 available, PZPN decided to include both of them in the Polish bid. While the Warsaw national stadium is rather recognised after Euro 2012, the 55,200-capacity giant in Chorzów remains anonimous and will only be ready in 2016 after a series of long delays. Portugal – Lisbon or Porto. The country officially expressed interest with hosting part of the game, but did not indicate whether it will be a single-city bid or one with both major agglomerations. It is understood that venues in each of the cities would be Estadio da Luz and/or Estadio do Dragao. Romania - Bucharest (Stadionul National). Having already hosted the Europa League final, new national stadium is now competing to get hold of group games during Euro 2020. Russia – Saint Petersburg (Zenit Arena). Russian FA indicated that Zenit Arena will be at the heart of their Euro 2020 bid. Perhaps surprisingly with Moscow awaiting for the revamped Luzhniki, the ridiculed, but still extremely modern stadium in Saint Petersburg might hold quarterfinals of Euro 2020. But will Russia be included by UEFA after hosting the World Cup in 2018? Serbia – Belgrade (new stadium or redevelopment). FSS are determined to bring Euro 2020 to Serbia and Belgrade has been submitted as the venue. Which stadium would host games? The choice is still to be made between redeveloping one of the existing stadiums (preferably Marakana, according to recent FSS statements) or building anew in a neutral location. StadiumDB.com understands Serbia is applying for the regular 50,000+ spot. Switzerland – Basel (St. Jakob Park). Not surprisingly the Swiss FA decided to launch a bid with the country's largest stadium, which still can only hope for a spot among the two exceptions. It isn't clear whether the stadium would need to undergo a major revamp. Turkey – Istanbul (Ataturk Olympiat Stadi). One of the strongest contenders for both semifinals and final game, especially with the planned expansion. National stadium of Turkey is to grow to 92,000 capacity and receive a retractable roof already in 2015. Ukraine – Kyiv (NSC Olimpiysky) and Donetsk (Donbass Arena). Ukrainians are approaching the Euro 2020 chances from two angles. They hope to fight for the final and both semifinals with Kyiv's national stadium, while at the same time launching a bid for one of twelve regular match packs with Donetsk.